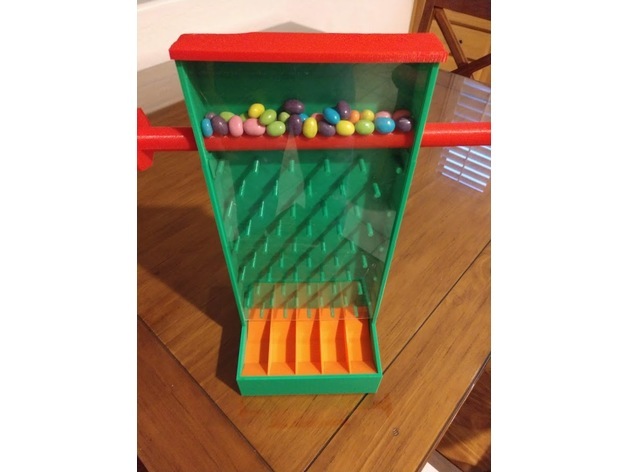 Plinko Candy Dispenser #3DThursday #3DPrinting « Adafruit Industries – Makers, hackers, artists, designers and engineers! Minor cleanup of the parts, and then superglue to put it all together. I cut a clear sheet of plastic for the front (found one that was about 1mm thickness from an old picture frame). There’s a groove in all the pieces for this to slide into. One minor problem is that the plastic tends to flex outwards and can result in releasing more than one jelly bean at a time.